Grant Design Collaborative and NeoCon—the commercial interiors industry’s premier event—have been linked even before our company’s founding. So many of our clients have participated over the years, and we’re fortunate to have had the chance to design many memorable and award-worth experiences along the way. This year was no exception with five participating clients. As such, winter flew by with a flurry of design activity, but it’s a process we love. Some of our best ideas emerge from the mix of disciplines, processes, concepts and tasks that collide in the studio as we move into the new year, and spring just wouldn’t be the same without it. Here is a recap of our client collaborations for #NeoCon15. Once again, Grant designed and choreographed Decca’s NeoCon experience for 2015 in collaboration with San Francisco’s Graham Design. After much deliberation, we selected the concept “non-standard” as their theme—a term that aptly describes the essence of architecture and design practice in today’s economy. Personalized solutions are the rule, not the exception, and by shifting the focus to the specifier’s needs, we highlighted Decca’s unique mix of expert craft, material luxury, and ability to scale furniture solutions in a relevant and compelling manner. Beginning with an iconic identity, we brought together current selections from Decca and Elan to create a series of workspace narratives. With a script written for each vignette and supported by a carefully curated suite of props, we brought Decca’s product design to life with stories that placed attendees into the design solution. The showroom became a working C-Level suite with areas designated for a Creative Executive, Executive Commons, a Modern Attorney, Huddle Space, Soft Conference and Library. The narratives also energized the Decca sales team by offering a storytelling device for product introductions that engaged beyond the standard list of features and benefits. Grant’s work included a full spectrum of support materials; including show advertising, press kits, walk-through packets, publicity tours, informational and identification signage, motion graphics, floral and event design, social media, website updates, digital brochures, and sales meeting digital presentations. An exhibition display was also designed for the Library’s display bookcase outlining Decca’s core attributes: material, craft and scale. 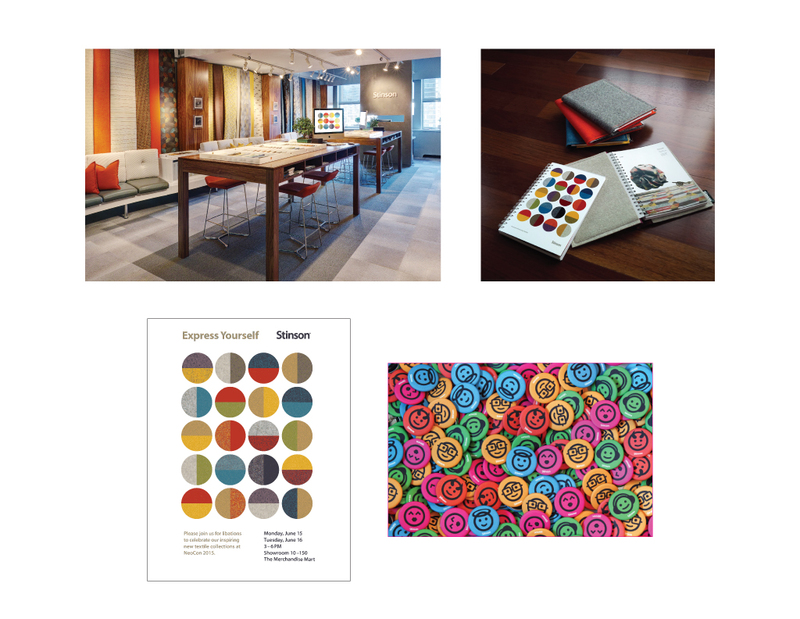 For the third year running, we worked with third-generation commercial textile purveyor CF Stinson to create their 2015 ad campaign and NeoCon experience. Feeling the need to elevate brand awareness, we enlisted acclaimed photographer Geof Kern to create images that portray textiles in unexpected cameos—infused with his heightened sense of drama and wit. In an industry dominated by beautiful, but staid product photography, we sought to create images with a conceptual depth that inspire contemplation, conversation, and value beyond mere aesthetics. A refreshed look at the advertising also afforded an opportunity to refine CF Stinson’s showroom experience. Grant designed new worktables and merchandising displays down the center of the space that encourage conversation and discovery of their new textiles. Additional support materials included an event identity and theme, product collateral, giveaways, signage, e-broadcast series, video loop, and floral design. In 2014, Canadian textile manufacturer Victor Group sought the brand expertise of Grant, enlisting us to design a new brand identity. The process began with the facilitation of collaborative work sessions among Victor leadership and all company constituencies. The initial phase culminated with research and interviews among architects, interior designers and product designers—all aimed at reinvigorating the brand. Based on our findings, Grant sought to soften the look with the architect and interior design audience specifically in mind. A clean, classic serif typeface set in all lowercase heralds the company shorthand, “Victor.” The addition of a ligature adds a decorative flourish in the center of the mark that recalls not only weaving but also a link to the multiple generations of textile designers and makers who are Victor Group. The center ligature also creates a “crown-like” aesthetic for added stature and presence. Debuting the logo at NeoCon, Victor Group’s new identity presents a brand that is classic, confident, sophisticated, and design focused. Grant Design Collaborative continued our longstanding partnership with ACT (Association for Contract Textiles) in 2015 by designing advertising to promote recent initiatives, including their mobile app and Facts certification program. 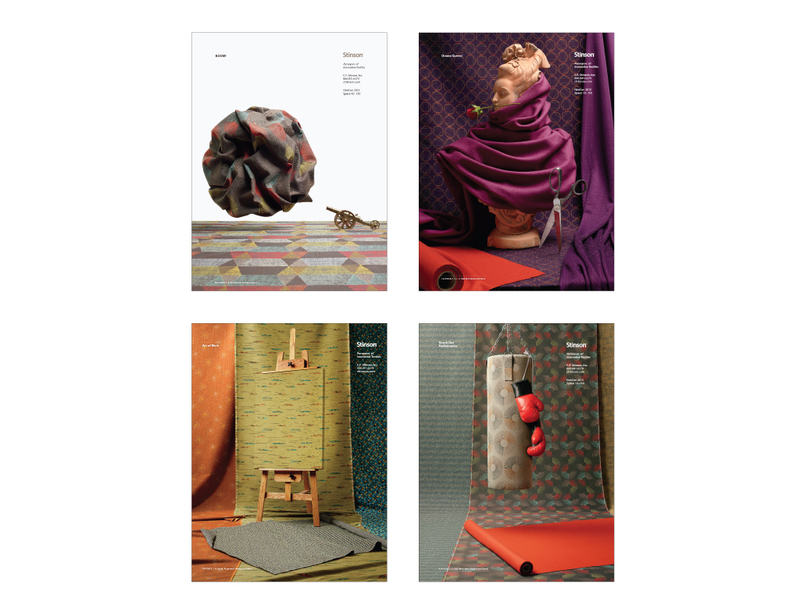 Once again, we designed presentation materials for their annual meeting at NeoCon and their new Abrasion Disclaimer guide aimed at clarifying misperceptions about the textile specification process. We also had fun creating some mementos for outgoing ACT President and our client, John Rowan! For me, this was my 31st consecutive NeoCon. While some things never change, we always learn something new from the event. As in past years, I was fortunate to have the great work of the Grant team to support our efforts, and I owe a special thank you to my right hand, Matt DeFrain, for his tireless efforts in Chicago on behalf of our clients. Whatever it takes, Matt delivers under pressure with grace and style. No one deserves that Gold Coast Hot Dog on departure more than he does! Here’s to #NeoCon16 and all of the surprises along the way.